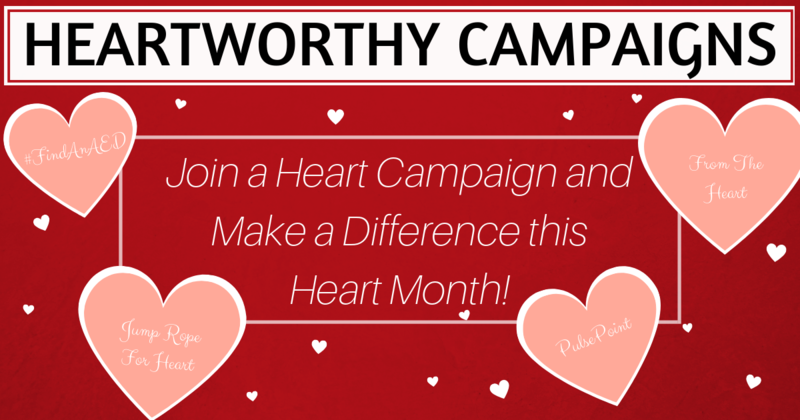 Heartworthy Campaigns – Join a Heart Campaign and Make a Difference this Heart Month - First Edition First Aid Training Inc.
Heartworthy Campaigns – Join a Heart Campaign and Make a Difference this Heart Month! If you know of a friend, family member, co-worker, or acquaintance living with heart disease, you may have wondered how you can support them. It can be difficult to know how to help, but the best way to get involved is to help EVERYONE. The only way we can prevent heart disease, discover new methods of treatment, and aid our friends and family, is to spread awareness! “How do I spread awareness?” you may ask? Easy! Join a heart campaign. Make a positive impact this heart month and take part in a heartworthy initiative! There are plenty of ways we can work to increase heart awareness and assist those with hurting hearts (just check out our blog for additional ways to help other’s hearts). The time to participate is now. Join us in making ‘Heart Month’ (aka February!) one that is full of action! Check out these Canadian heart campaigns and join the movement to make a difference. An AED is a life-saving device that is crucial in saving someone having a cardiac arrest. In fact, by having an AED nearby, a person’s chances of survival will DOUBLE. So how can we make sure AEDs are readily available? Tag @FirstEditionAED so we can share it too! When we take the time to find and share these defibrillator locations, the better everyone’s chances are to act fast and help a heart! Created by the Heart and Stroke Foundation of Canada, Jump Rope for Heart is a heartworthy campaign that is encouraging kids to JUMP! This heartworthy campaign works to encourage children to get active with their classmates and teachers, jumping rope to raise money for heart and stroke research. In addition to the goal of raising funds, this campaign is also working to help children identify new ways to keep their own heart in tip-top shape. Jump Rope for Heart is the perfect way to encourage children to add exercise and fun into their daily lives. To participate in this energetic campaign, parents or teachers can log on to the Heart and Stroke Foundation website and register their child. Once registered and connected to their school, each child can begin fundraising (done online) and skipping away! Last year, this heart campaign raised over $32 million for advancing heart and stroke research, as well as supported over 800 researchers. It is action like this that will make a difference. Get your child involved with heart month and skip to the beat! It is truly amazing to hear survival stories of individuals suffering heart-related emergencies and coming out with a smile on their face. What makes these stories even more heartwarming, is hearing just how many people jump in to assist without a second thought. Sister, fathers, friends, teachers, coaches, and total strangers have all been found to run to the aid of someone and perform CPR to save a life. These stories serve more than just giving us the ‘feel-goods.’ It is these news articles that can inspire action. When the public sees how big of an impact CPR and using an AED can be (and that it actually happens more often than we wish), they may follow suit and get the training necessary to make a difference! In order to share these stories with a wider audience, First Edition has created the ‘From the Heart’ campaign. Through the use of social media sharing, we hope to distribute these stories across the globe and demonstrate just how life-altering first aid skills can be. Any time you see a news story that is about a heart being saved, simply share it using the hashtag #FromTheHeart! Do you know of someone who has personally made a difference or made a miraculous recovery? We want to hear all about it! Tweet, message, or email us with your life-saving story and tell us all about the actions taken ‘From the Heart’ to save another life! Want to be inspired? Be sure to follow our pages for featured #FromTheHeart posts this heart month! Imagine a movement that reaches out to individuals across the globe, informing them that someone nearby needs their help. You get an alert on your phone telling you to run 2 blocks over to apply your first aid knowledge and assist someone in need. Because you were so close, you are able to begin chest compressions to a cardiac arrest victim before emergency responders can arrive. Your close proximity and immediate action has just saved a life! This is the goal of the PulsePoint app. By connecting with emergency service providers, the app is designed to alert users of nearby emergencies and guide them to the scene as quick as possible. The app uses a map-based program to show where you need to go to help someone, directions on how to get there, and where nearby AEDs are located should you require them. The more people that have the app, the more we can rush to the aid of individuals in need! 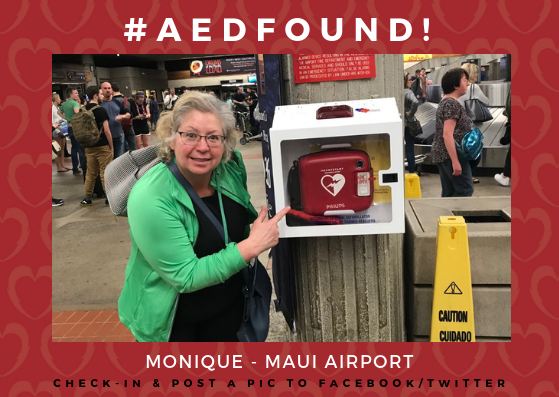 Download the app on your phone and begin to record new AED locations (while doing your #FindAnAED posts!) and complete your profile so you are ready to run to the rescue. If your city does not yet have PulsePoint, contact your local government or mayor to request initiating this amazing program! Join the millions of users in making our world a safer place! There are countless unique opportunities for us to get involved in that will increase public safety, help hearts, and make a difference! Want to involve the whole family? What better way to get involved than to share these heart campaigns with your children. Make finding AED locations a fun game, jump rope together, register for a group first aid course, and work towards ultimate heart health! It is time to share the love! Happy Heart Month!